Halolactones are used both in chemical synthesis as intermediates as well as in various industries. These compounds may be secondary metabolites of living organisms, although they are mainly obtained by chemical synthesis. 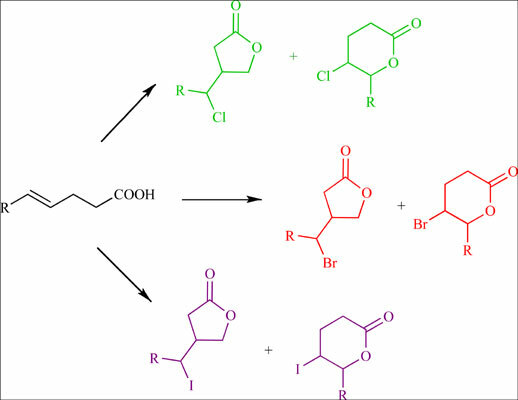 The substrates for the synthesis of chloro-, bromo- and iodolactones are often unsaturated carboxylic acids, and sometimes they are unsaturated esters. The article presents a number of different methods for the production of halolactones, both racemic mixtures and enantiomerically enriched compounds. Analogues compound, halolactones, halolactonization, carboxylic acid, synthesis, asymmetric lactonization.